This week we are celebrating Jerome's 50-puzzle points leap with an exclusive interview. Everything you ever wanted to know about Jerome but were afraid to ask. First of all, below is a caricature of Jerome created especially for this occasion by his wife Mary. This is how Mary sees him when Jerome solves puzzles - inattentive even if abducted by aliens. Q: Jerome - you live up there in Canada - quiet and confident country with plenty of natural resources; a country that may be a perfect nuclear shelter should we need one; country that was smart enough to attract foreign intellectual talent when other countries experienced "brains loss"; country that respects its immigrants and celebrates their food. Anything else you like your country for or disagree with me? Well we do celebrate the food of our ancestors. We probably have the original stuff they brought from the old country stored somewhere. Parts of Canada provide natural refrigeration. As the brain drain, sore subject. We actually loose our best and brightest to the United States. My own brother (my only sibling) left for the United States (at age 21 never to return again) after obtaining his Engineering Physics degree from the University of Alberta with a scholarship from Stanford. As to nuclear shelters, we never think of ourselves that way, especially in winter. The ground is as hard as granite beginning in October. In some parts of the country it does not completely unthaw until the following September. Come to think of it the soil is a bit unusual in places. People routinely take off their shoes when entering a house especially in spring. That goo that we have outside our doors could be exported for glue. Someone might think of that when we run out of oil and natural gas. I don’t know how confident we are as a country either. I sometimes wonder about that. The only thing I know for certain that we are proud of is our Hockey teams. Phil Espisito could have run for Prime Minister sometime in the middle 70’s after the 1972 series with Russia. We’ve even had films made about those 8 games. I saw a video the other day called 1972. They weren’t speaking about the year the Godfather hit the movie houses. Not in Canada. Q: On a flat map Canada appears much larger than the US. Do you think it actually is larger? Yes, Canada is larger than the United States. I always like to quote what somebody said about the size of Texas when he heard that Alaska joined the union. Upon learning that Alaska was 2.5 times the size of Texas he said “Well, maybe. But 2 and half times nothing is still nothing.” From the visits I’ve had in the United States, I think some Americans feel that way about Canada as well. But a little known fact about both countries is that Canada is larger in total area, but the United Stateshas a larger land mass. Canada has more water. Q: Are you closer to the North Pole than you further away from the Equator? Can’t do anything with this question, but when I was little my mother used to say that Santa would hit us before anyone else and if I wanted to be good I’d have to go to bed early. I was seven before I realized why she said that. Even so, I always found out where she hid my Christmas gifts. My birthday is Dec 23 so actually two occasions were ruined. Q: Do you think your head of state, Queen Elizabeth II, is good at math? I do know that even though she’s one of the richest women in the world, she has to have some math sense to figure out the allowances for all her children, grand children, nephews, nieces, aunts uncles, and sundry others. 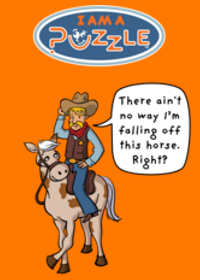 Q: Why do you solve puzzles? I don’t really know why I do it. I usually find out something by doing it. I like problems because unlike the rest of life, at least one knows when one has reached the end of a task. You either find out that you can do it, or you find out you can’t. Either way, it’s satisfying. If I cannot do it, I can hardly wait to find out how it’s done. I’m competitive, but I also appreciate a good question that I cannot see the answer to, but think I should be able to. The first puzzle I paid attention to was actually on a television program. It came on when I was in grade 9. It was about a kid who fell in love with the school queen but all he could offer her was a science fair project that played tic tac toe. I wondered how one could program such a thing. Later when my son was in Grade 7, I developed a program based on a 3 by 3 magic square that could play a passable game of tic tac toe on a TI programmable calculator. Such things sound simple now, but back then it wasn’t simple. Q: Do you have a favorite puzzle? At most only 1 statement is true. Where’s the lady? Q: What was the best job you ever had? The best job I had was teaching at a technical institute in Alberta. (A small plug for the Northern Alberta Institute of Technology [affectionately called NAIT -- in near by Edmonton). I was hired as an up grader in Math and Physics. I started in 1997 when the Alberta Government had the bright idea of sending everybody on welfare and disability back to school for retraining. About 1/5 of my classes were single mothers. These were people that were between 22 and 25. The last time they saw a classroom was at the age of 15 or 16 and of course were charmed by some guy driving a 4 wheel drive whose IQ matched the number of wheels on his truck (generously including the spare). They had a good line, but not much character. By the time I saw these women 2 children later, they were scared to death of the subject matter I taught (Math / Physics), but they knew that the guy who got them to quit, had moved on to some other girl who was too young to know that a guy who leaves his children hasn’t got much going for him except his truck. Eventually, after about 2 weeks and a few tears, they learned that they could do the stuff as long as I never asked them anything that I hadn’t taught them before. The secret to any success I had was to make the numbers come out evenly, and to drill drill drill and more drill. You really do have to go through Piaget’s steps of learning. Just because they were over 18 doesn’t mean they were ready for critical thinking. Towards the end of the term (a term was about 20 weeks), one could ask slightly more difficult questions, but no more than 1 step beyond what they already knew, and a very small step at that. 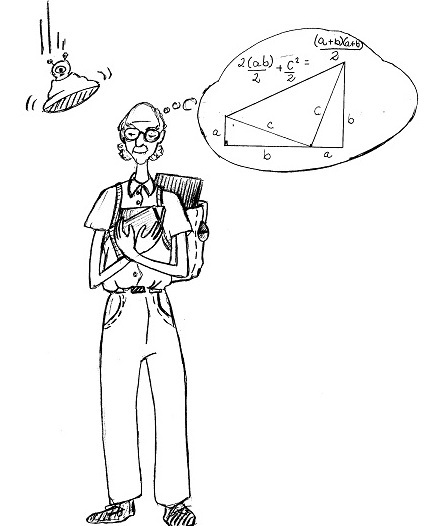 Q: How did you become interested in math as a child? Was there a parent, teacher, journal or specific experience that encouraged you? My brother influenced me. If he could do it math so could I. Problem was he could really do it. I had to work at it. Q: You wrote to me thanking for recommending a Spot It (Dobble) game and complained that your life always win over you. How is that? Mary still routinely and severely beats me even while she has cold and cleans out a Kleenex box with one hand. To get better I practice playing by myself. I play a kind of Solitaire. I deal out a top card and a match card. I go through 54 matches in 11 minutes 55 seconds. Mary can do it in about ½ the time. You only get to remove the match card (the one that you turn over). Keep alternating the one you take away. I’m never going to match Mary’s time which is terrific. As I said, she’s not much on games and I’m delighted that she can take me apart.